the Neros were fiddling...(Actually Nero played a lyre and may not have been playing when Rome burned, but I haven't ranted here in awhile), and I saw this snippet on the Fed et al, and what is now our current gang of econ/banking/treasury geniuses. Hindsight is nearly poifect, but any 2nd year Econ student knows/knew that the Fed didn't link with the Treasury much, and neither paid any attention to 'Wall Street'/Investment 'banks' that were busy dreaming up and pumping/pimping CDOs, CDSs, et al, and the SEC was basically acting as crooked cops selling dope in the school yards, imo. GL...we will need it everymore, in the next round of mayhem. From today's NewYawkTimes...worth the < 5min read, imo. A Federal Open Market Committee meeting on March 28, 2006. Many of the officials who appear in the transcripts have since spoken publicly about the Fed’s failings in the years before the crisis. But the transcripts provide a raw and detailed account of those errors as they were made. Evidence of problems in the housing market accumulated at each meeting of the Federal Open Market Committee, which sets policy for the central bank. “We are getting reports that builders are now making concessions and providing upgrades, such as marble countertops and other extras, and in one case even throwing in a free Mini Cooper to sweeten the deal,” George C. Guynn, then president of the Federal Reserve Bank of Atlanta, said at the June meeting. 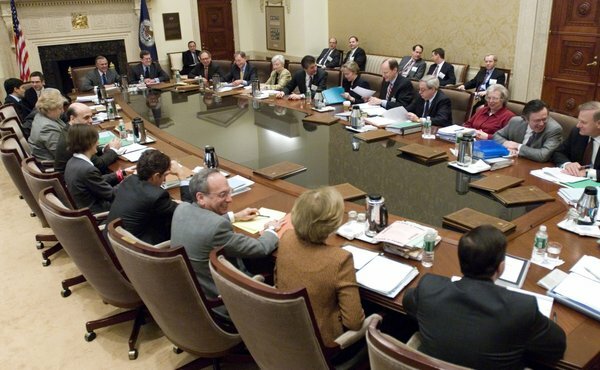 The committee consists of the governors of the Federal Reserve and the presidents of the 12 regional banks. “The speed of the falloff in housing activity and the deceleration in house prices continue to surprise us,” Janet Yellen, then president of the Federal Reserve Bank of San Francisco, said in September. For a famously private institution known for its cryptic, formulaic statements, the meeting transcripts offer a rare glimpse of senior officials in relatively unguarded conversation, somewhat akin to the tapes that some presidents have made in the Oval Office. The Fed officials exchange jokes, gossip about people who are not present, and speak much more frankly about the economy and policy than they did in the public remarks that they made contemporaneously. The results are unlikely to burnish any of their reputations, inasmuch as they could not see the widening cracks beneath their feet. But the Fed’s chairman, Ben S. Bernanke, appears as the most consistent voice of warning that problems in the housing market could have broader consequences. As the year rolled along, however, Mr. Bernanke increasingly took the view that his colleagues were too sanguine. ”I don’t have quite as much confidence as some people around the table that there will be no spillover effect,” he said. Some Fed officials argued that a housing slowdown would be good for the broader economy. “I really believe that the drop in housing is actually on net going to make liquidity available for other sectors rather than being a drain going forward, and that will also get the growth rate more positive,” Ms. Bies told colleagues at the committee’s June meeting. Ms. Bies could not be reached for comment Thursday. One fundamental reason for this blindness was that Fed officials did not understand how deeply intertwined the housing sector and financial markets had become. They also were convinced that financial innovations, by distributing the risk of losses more broadly, had increased the strength and resilience of the system as a whole. “I would say that the capital markets are probably more profitable and more robust at this moment, or at least going into the six-week opportunity, than they have perhaps ever been,” Kevin Warsh, the Fed governor who watched Wall Street most closely, said at the meeting in September 2006. Three months later Mr. Warsh said almost exactly the same thing. He did not respond to an e-mail seeking comment Thursday. For the Fed 2006 began with the departure of Mr. Greenspan, who presided in January over his final meeting as Fed chairman and was then widely regarded as the epitome of a central banker, a master who had guided the American economy through almost 20 years of remarkably consistent growth.